China and Russia have signed over 30 agreements in economy and trade, infrastructure, technology and innovation, finance, energy and agriculture. Russian President Vladimir Putin met his Chinese counterpart Xi Jinping in Beijing on Saturday where they took stock of ties. “A broad range of bilateral cooperation matters and issues on the international agenda were discussed”, according to a Kremlin statement. As both nations are the world’s major economies and emerging markets, Xi said they should deepen “pragmatic cooperation and alignment of interests, and push forward the dovetailing of the Belt and Road Initiative and the Eurasian Economic Union (EEU) for broader regional economic cooperation”. An “official start” was announced for talks on a trade and economic cooperation agreement between the Chinese Silk Road project and the Russian Eurasion Union project. The central banks of China and Russia on Saturday signed a memorandum of understanding on setting up a yuan clearing mechanism in Russia, the People’s Bank of China said. This would be beneficial to cross-border trade and investment, said the PBOC. Putin also stressed on cutting out the dollar from bilateral trade. “To reduce dependence on foreign exchange markets, we are expanding the use of national currencies in mutual settlements. The share of payments in Russian rubles is three percent, and the share of the Chinese yuan is even greater at nine percent. The latter figure should rise significantly after Russia establishes a clearing and settlement centre for the yuan,” Putin said in statements made to the press after talks with Xi. 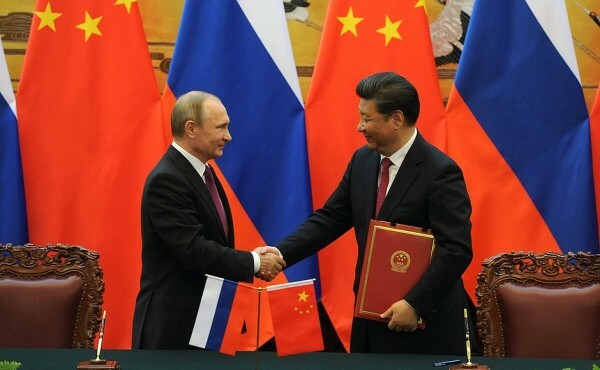 On Saturday, Putin and Xi witnessed signing of deals including the sale of stakes in a number of Russian projects to Chinese firms, an oil supply contract and joint investments in petrochemical projects in Russia. China National Chemical Corporation will buy a 4o per cent stake in Russian oil giant, Rosneft’s petrochemical complex VNHK in Russia’s far east. The two countries also signed a deal to develop a new long-distance aircraft to compete with Airbus and Boeing. 58 different deals worth a total of around $50 billion were currently in discussion, the Russian President announced. They are also hoping to clinch an agreement on a high-speed railway line between Moscow and Kazan, some 700 kilometres east of the capital, by the end of the year. After talks in Beijing, the two countries signed a joint statement on bilateral relations, a joint statement on strengthening global strategic stability and another on information development and cyber space. The two allies have taken similar stands at international forums, including the UN, on major global crises, including Syria, Iran and the South China Sea. “China and Russia should resolutely safeguard the purposes and principles of the UN charter, the basic norms of the international relations, global strategic balance and stability, as well as international justice,” Xi said. “Assistance in the Syrian peace process, supporting peace and stability in the South China Sea and Central Asia are among our common foreign policy objectives,” he added. In a boost to the Russian leader, the Chinese President denounced western sanctions against Russia. “We oppose the use of force and threats of using force, casual introduction of sanctions and threats of sanctions, and a unilateral policy and unilateral actions without consent form the parties concerned,” Xi said. With the political landscape in Europe threatening to further corrode economic recovery, Xi and Putin were quick to stress on the shared Sino-Russian outlook. “President Putin and I have unanimously decided that the more complicated the international situation, we must persist even harder in maintaining the spirit of the Sino-Russian strategic partnership and cooperation,” Xi said during a press conference. From January to May this year, bilateral trade amounted to $25.8 billion, growing by 2.7 per cent compared to the same period last year. Putin, on Saturday, admitted that “energy of course remains the locomotor of business relations” between Russia and China. On Saturday, Rosneft and ChemChina signed a deal that could see the Russian firm supply up to 2.4 million tonnes of crude oil to China between 1 August, 2016 and 31 July, 2017. Rosneft and Beijing Enterprises Group Company Limited also agreed the key terms of a potential sale of a 20 per cent stake in Rosneft’s oil producing subsidiary, Verkhnechonskneftegaz, to a unit of Beijing Gas Group. Putin also announced that China and Russia “are now negotiating further joint operations in third country markets” in the nuclear energy sector.